This book is all about exploring and discovery. 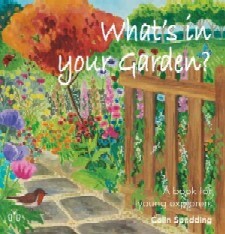 It encourages children, age 7-11 years, to take an active interest in the natural world around them and to explore it, starting with their own garden. It includes numerous line drawings by the author to stimulate children to draw for themselves and thereby more closely observe wildlife. In addition, the many questions asked aim to make children think for themselves rather than just absorbing 'pre-packed information. The paintings on the cover and inside are by Isla Woiwod. Can you tell the difference between a butterfly and a moth? Butterflies are out during the daytime; moths come out at night - but not all. Butterflies usually rest with their wings folded above their backs. This has the advantage of hiding the brightly coloured upper parts of their wings, so that birds, which eat them, are less likely to see them when they're not flying. Moths rest with their wings streched out. Many butterflies are brightly coloured, whereas moths are mostly pale cream or brown, although some, especially day-flying ones, can be very colourful. Do you know what causes the colour on their wings? Probably when you think of nests you immediately think of bird's nests. But lots of other animals make nests too - bumblebees, for example. Why do animals build nests? With birds, of course, the answer is easy - to lay their eggs in. All garden birds do, although in the case of pigeons this is usually a platform of twigs in the branches of a tree. And in fact, some birds don't build nests at all. Certain seabirds just lay their eggs on a rocky ledge. But why, you might ask, do birds need nests to lay eggs in? Recommended as complementary material to the Key Stage 2 National Curriculum. Dr Kate Baker, Head of Science, Melbourn Village College, Cambridge.